We work with municipalities to assess impacts of stormwater runoff on local water resources through inventories and mapping of stormwater drainage areas, inlets, outfalls, and treatment structures in urban areas. We classify landuse types and map impervious surfaces within drainage areas to estimate pollutant loadings to local lakes and streams. Following surveys and assessments of the stormwater area, we develop comprehensive stormwater management plans. 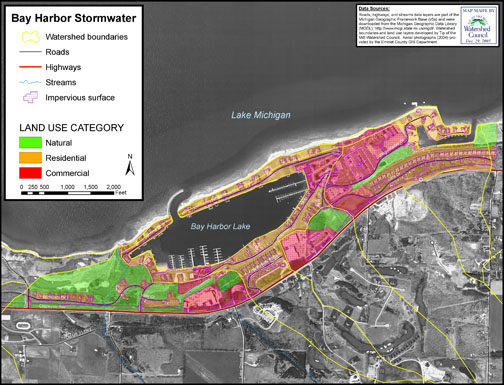 These plans are used to guide municipalities, associations, and others in efforts to reduce or eliminate stormwater impacts to lakes, streams, wetlands, and groundwater. We provide recommendations on the type and design of residential, commercial, and municipal stormwater best management practices (BMPs) including rain gardens, stormwater wetlands, pervious pavements, filter strips, and other surface runoff treatment methods.